On this page you will find links to my blog, presentations and the new and improved Tech Tools I have put together for you! These tools are organized by topic and I am always adding new items here as I find them. Definitely check out this page to find some tools to integrate technology into your classroom. During a team meeting recently Zach S. told me about this website called, Draw a Stickman (http://www.drawastickman.com/). After checking out the website I could see why Zach thought it was so great. Draw a Stickman is a site where you have to literally draw a stickman and follow the directions given to you. It becomes an interactive tale with a hero, a villain, and a cool story. How can it be used in the classroom? 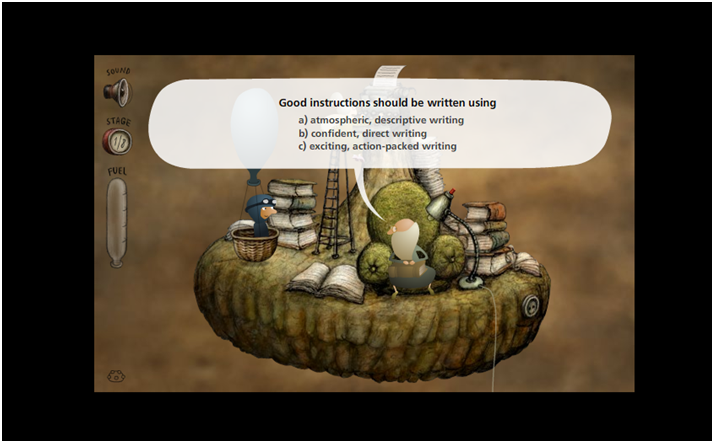 It is a great way to start a story and students can fill in details, vivid verbs, adjectives, etc. to tell the story. Students can focus on pinpointing parts of a story such as characters, details, setting, moral, etc. I think it allows for a lot of flexibility and creativity for students with the story. It is definitely worth checking out! SMARTBoard – did you know??? As I have been planning my lessons this school year I have stumbled across a few a-ha’s when creating lessons. I wanted to share with you some of my favorite. 1. SMART Exchange – I know many of us know about this already but did you know that you can filter your searching by 3D lessons, manipulatives, math, etc. ? You can find this option on the left hand side of the screen. *Just a reminder too – SMART Exchange now requires a login, you can create your own for free on the site. – Open the second lesson and “restore down” the lesson (that’ s the button next to the close (red X) in your browser. – Then open lesson 1 and “restore down” so you can see each lesson side by side. Are you a visual learner? Watch a video of how it’s done. 3. Did yo know that in SMART Exchange, if you search by file type you will see “manipulatives” – here there a couple I would recommend you download. First the SMART Speller and Number Crunchers. These are awesome manipulatives for your students to use on the SMARTBoard. So, what I want to know is what is the a-ha you’ve had? I’d love to hear what you have found that has made life just a little easier. Want to catch up on your current events and don’t want to just read the Herald Times Reporter or Green Bay Press Gazette? Then check out the Newseum. This website shared with me by Dawn K. has front pages of papers from all over the world. This would be a great site to show different perspectives on same world events. That not enough Social Studies for you? Then check out the JFK Library where you can search through tons of digital artifacts and historical documents. My favorite part? There are oral history recounts of famous events, such as the Bay of Pigs invasion. Thanks to Carly this week that shared this site with me. She was observing at another school and saw the students playing the game Questionaut and having a blast! So I checked out the site and it was very cool – great graphics, no adds, and challenging questions in multiple content areas. I would say this site would be good for our 4th – 9th graders. When I did some more digging I came up with the site that the game orginates from. The site is sponsored by the BBC, so there is a definite British flair to some of the language, but has great activities and educational games. 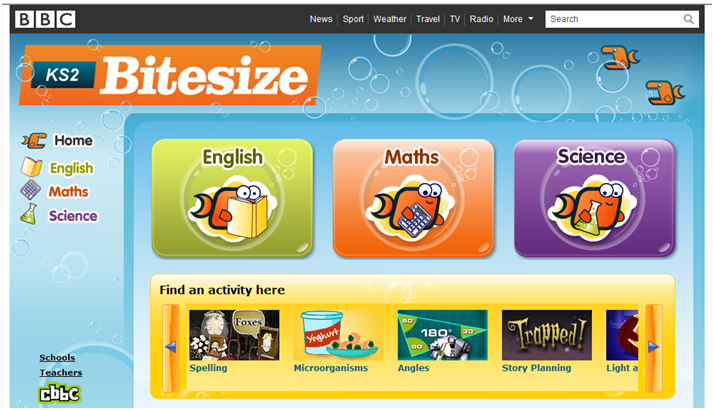 Check out the Bitesize page for other games and activities! 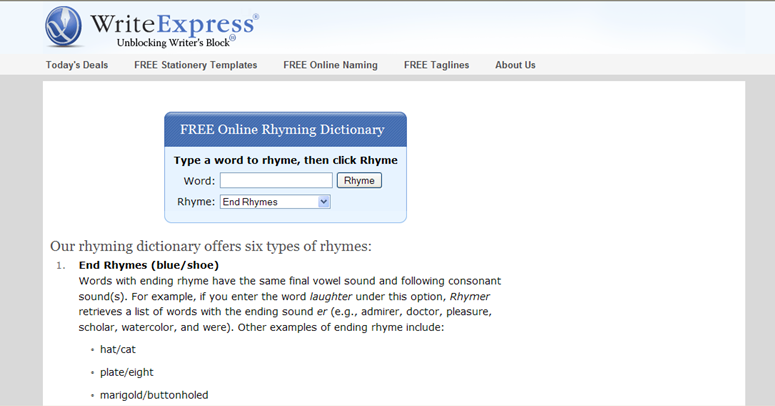 This week Jessica B. sent me a site that was introduced to her by Tom S. The site is free online rhyming dictionary. It is a great tool to help them when they are stumped on rhyming words. Jessica used it when she had her World Literature students write their own Canterbury Tales using couplets which can be pretty difficult for students. Tom used it when students were struggling writing poetry on elements in Chemistry. Another great word site is Wordnik when you type in a word you will get the definition (from multiple sources), examples, photos, thesaurus, etymology, pronunciation, some statistics about the word, and phrases containing the word. They have other features like the word of the day and random words as well. So, I checked it out and Jen was right – it is FANTASTIC! The National Archives website helps to “turn your students into historians with primary-source based activities that develop historical thinking skills.” The activities are easy and ready to use in your classroom. You can login in to borrow from an even larger selection from fellow educators. Check it out – let me know what you think and especially let Jen know what you think -thanks for sharing your passion Jen! This week I want to feature a couple of website I found that have interactives to use in the classroom. Much of the content is geared towards literacy and math, but the last link also includes other content areas. While I think that most of the interactives are most appropriate for elementary or middle school, I think some ideas can be adapted for high school as well. Take a couple of minutes check it out. Add it to your favorites, Diigo, or Delicious sites! Here is a fun website to use with students – I’m thinking it could work fantastic in your Word Work time. The Kids’ Poetry Page is a site where students can play with words online and create poetry. They can also check out the online collections of poetry. This website definitely makes creating poetry and using words fun! As we come back from spring break, I have a website that I found to be quick and easy to use. The University of Missouri created a website called eThemes. This website is divided up into grade levels but has tons of resources on specific themes for each grade level. When you find the theme you are looking for and click on the link there are a whole list of resources available for that theme.